Welcome to HallsGreenhouses.co.uk, a family run online store specialising in providing only the highest quality greenhouses, staging and accessories for your gardening needs. Being established in 1999, you can be rest assured that we have the experience, knowledge and customer service needed to provide our customers with the right products at the right price. In an uncertain world it’s reassuring to know that you can rely on Halls Greenhouses. 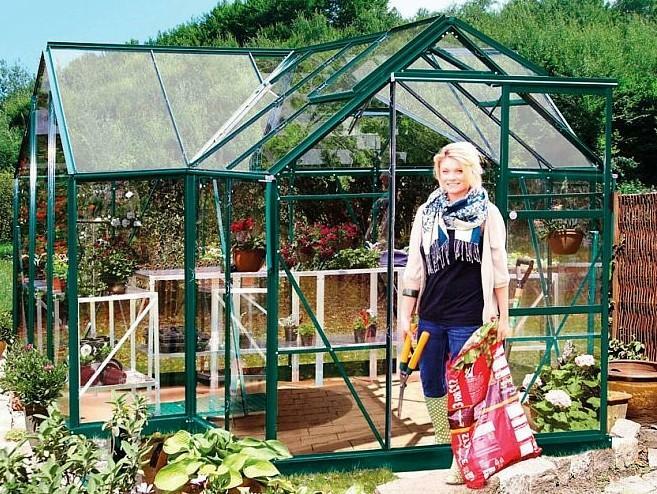 Why pay more when a Halls Greenhouse offers such superb design and exceptional specifications. We have listened to our customers, from beginners to experienced gardeners, and the result is a fabulous range of great greenhouses. Whether you have a restricted outside space or spacious garden, we will have something to suit. From compact models that fit neatly into a small area to cavernous greenhouses in which you can grow an enormous variety of plants. They all offer wonderful value for money. Low maintenance frames are made from high-grade rust-proof aluminium with a baked on, highly durable, powder coated finish. There’s a choice of glazing for maximum light transmission and the excellent ventilation is ideal for your plants to thrive. Styles vary from our practical Popular range that will be a fine addition to any garden, all the way up to the magnificent Magnums with double doors, spacious headroom and extraordinary build quality. There’s also the delightful Halls Orangery, and if you haven’t the room to accommodate a freestanding greenhouse, there are our Wall Gardens and Lean To’s that make as much use as possible out of any available space and look so good. To really make the greenhouse your own, take a look at the many accessories that are available, including louvre windows, automatic vents, shelving and staging. Delivery is quick and easy, order online and we should have your greenhouse with you within 14 working days, and on many occasions a lot sooner. And of course it is included in the price, what you see is what you pay. And don’t forget, because we value your custom if you find any of our products in stock and immediately available at any of our competitors, we will guarantee to match their price. Make life simple, deal with a reputable, long established company with hundreds of satisfied customers. For expert advice, talk to our greenhouse team now on 0121 776 7642.